Each patient form provides your physician and our office staff with the information necessary to offer you the best possible diagnosis, treatment, care, and service. Please complete the forms listed below prior to your arrival at the Huntsville Endoscopy Center. NOTICE: The following forms are for the Huntsville Endoscopy Center visits only. If you need forms for the Center for Colon & Digestive Disease, please go here. Beneath each form listed below is an explanation of who should complete the form. Huntsville Endoscopy Center's patient forms utilize the latest technology but also cater to those who prefer a more traditional approach. The forms here on the website look exactly like the ones you would receive in our office. However, the forms on our website provide you with one additional benefit - the option to use a pen OR computer to complete the form. Here's how it works. Simply click on the form you wish to work with. Be sure it opens inside the free Adobe Reader (Version 10 or higher please). 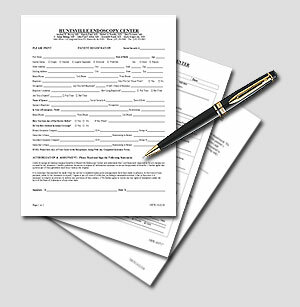 From within Adobe Reader, you can print the form on your printer and later use a pen to complete the form. Don't forget to sign it, date it, and or course, bring it to our office on the day of your appointment. For those of you who would rather type, again open the preferred form in the free Adobe Reader (Version 10 or higher please). Then, simply click the first form field to begin. Enter the requested information (for instance your name) by first clicking inside the text field and then typing your information. Once you've completed that form field, click on the next field with your mouse (on computers), tap on it with your finger (on touch-screens), or use the "Tab" button found on standard keyboard. This will advance you from one form field to the next. Some form fields don't require any typing - they just require a click/tap. The round buttons are called "radio buttons" and they provide a way for you to make a single choice from multiple options (for instance choosing "Yes" or "No"). One other type of form field is the square check box. Check boxes are like radio buttons with one exception. Instead of selecting just one option, you can select multiple options with check boxes (for instance you might choose multiple options like "Mother" AND "Father" AND "Sister" AND "Aunt" AND "Grandmother". Simply click one or as many square check boxes as is required. When you have completed all necessary form fields, please print the form, then make any necessary notations or corrections with a pen. Finally, please sign it, date it, and of course, bring it to our office the day of your appointment. Completing the forms with your computer is ONLY SUPPORTED by the free Adobe Reader (Version 10 or higher please). It will typically NOT WORK inside Google Chrome, Firefox, Apple Safari, Opera, Internet Explorer, Edge, or other browsers even though they may display the form. All Patient Forms - contains all 3 forms below. To protect your privacy, our patient forms NEVER capture, submit, nor otherwise transmit your personal health information over the Internet. However, any information you enter into one of our forms via a computing device may be stored on YOUR computer, phone, tablet, or printer. If this is a point of concern, please consult the the manufacturer, developer, or service provider (Microsoft, Google, Firefox, Verizon, AT&T, Hewlett-Packard, Adobe, etc.) for instructions on how to delete your browser history and any other cached information.